Immediately after registration, you can fill out the questionnaire about your company and fill in your system's technical settings. You can do it simultaneously. Yet we recommend start with the questionnaire—while our managers are checking it, you can handle the settings. With the non-Russian companies, we work under different scenario. Our questionnaire includes several sections marked off with a grey tick. When you complete a section, its tick turns green. Number of these sections depends on the details you provide. You can provide your company's name in English, if it is referred to this way in your company charter or other constitutional documents. Be sure to fill out the field Description of basic activities. Sole proprietor cannot be his or her own beneficiary or have beneficial owners. The corporation's CEO can be its beneficiary if this CEO owns more than 25% of the corporation. A corporation cannot be its own beneficiary. 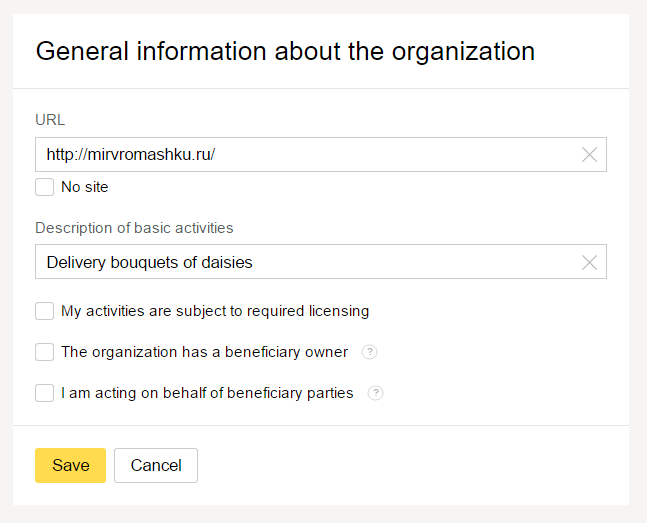 If you check the sections My activities are subject to required licensing, The organization has a beneficial owner, I am acting on behalf of beneficiary parties, the questionnaire will grow an additional section. Click the question mark to read through the hints. When everything is filled out, click Save. 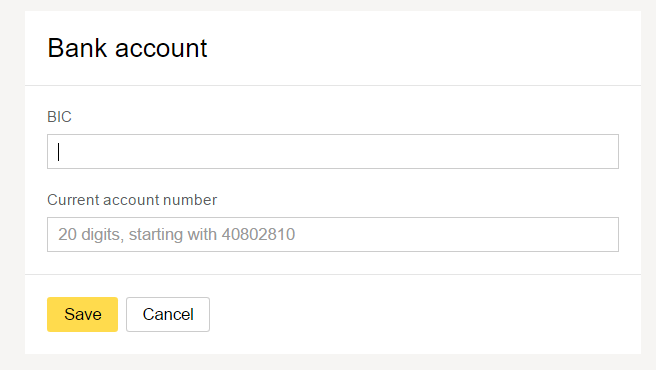 By default, we display the details you provided when registering your Merchant Profile. You can change these details or add other contacts: on financial, technical, or any other matters. For that, click the plus sign in a green circle. We send messages with settings to the email address provided for technical matters. To delete a contact you do not need, click the minus image in the red circle near the name. 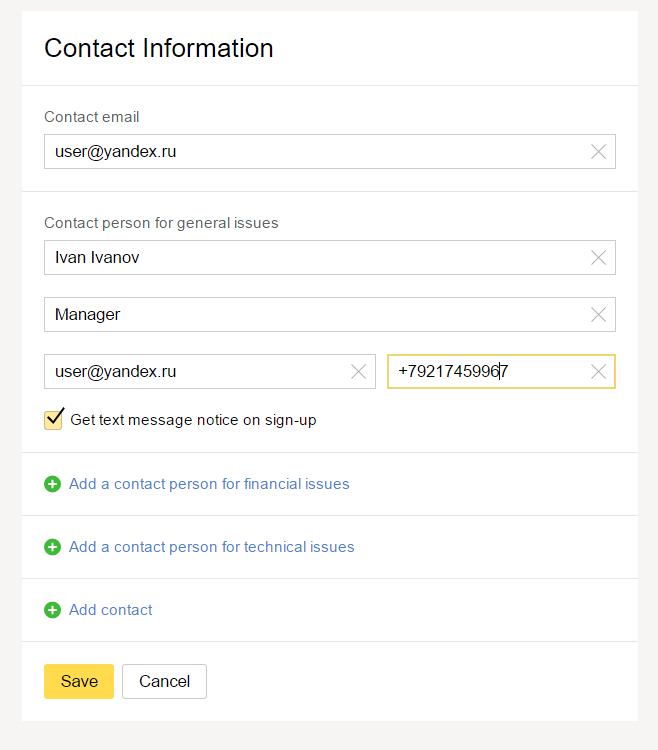 Get text message notice on sign up—if you check this box, we will send notices on signing up for Yandex.Checkout to the phone number on the right. For instance, status of this questionnaire's check. You can change this phone number. Specify BIC of the bank managing your checking account. The following information about the bank will automatically appear below: name, correspondence account, city. Important! If you see a notice that something is wrong with the BIC number, check whether everything is all right with your bank and the details are up-to-date. Specify your company's checking account. We will send money to it. Fill out the fields as in your chief executive's passport. If a representative of the director is going to sign the contract, uncheck the box The director will be the signatory of the contract. Upload scanned copy of the director's passport. We need two pages: the main one, and the one with the registration. Scan the original passport: scanned copy of a copy won't do. If your business is subject to licensing, upload scanned copies of the licenses in the field 'Other Documents'. scanned copy of the signatory power. When the form is filled out, push Send Form. You can only make it when all sections turn green. The check will take 1 to 3 business days. You can view the results under your Merchant Profile or wait for the email notification. If the form has errors, you will see a notice on that in your Merchant Profile or get an email notification. The field we suggest you to check will be marked red. If you've checked Get text message notice on sign-up, we will send you texts about your application status. 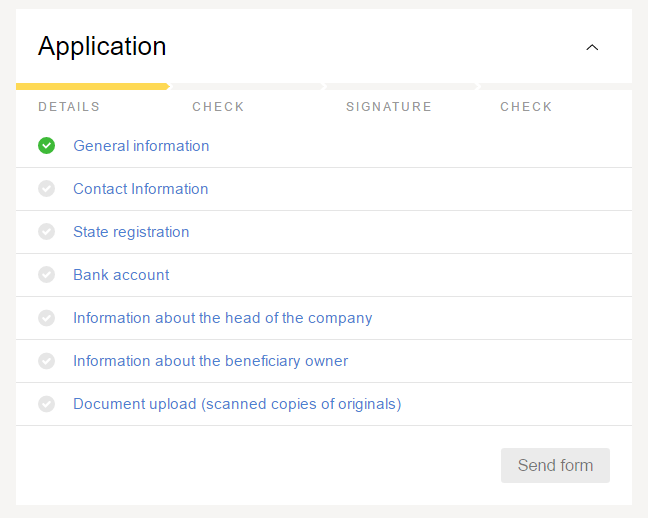 When the form is reviewed, a ready-made application for sign-up, created from your details, will appear under your Merchant Profile. The application will be considered your contract with Yandex.Money. You will need to download this application, sign all its pages, scan them, and upload these scanned copies to your Merchant Profile. When it is checked (it takes 1 to 3 business days), you will see additional sections in your Merchant Profile—Company and Contract. 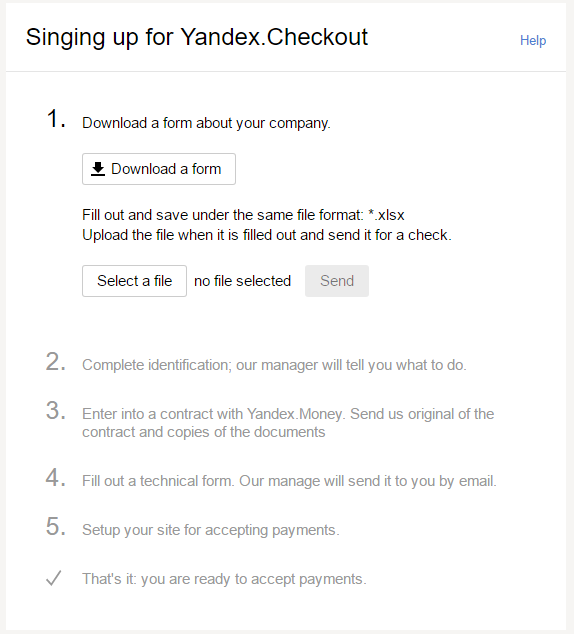 Since that moment, your contract for payment acceptance with Yandex.Money is active. If everything is ready on the technical part, you can start accepting payments. 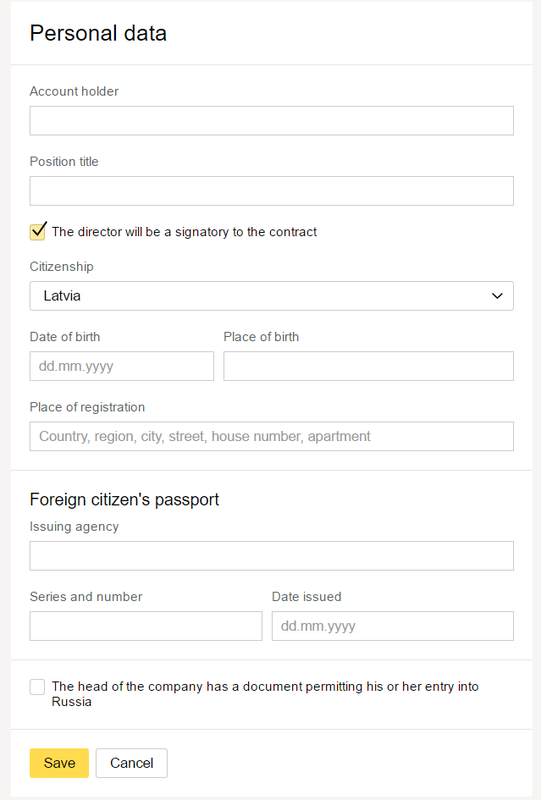 If your company is registered outside of Russia, you will see an instruction on signing up after registering. Under your Merchant Profile, you can download a questionnaire about your company and upload it back to us when filled out. After checking the questionnaire, our manager will contact you and guide your through further steps.